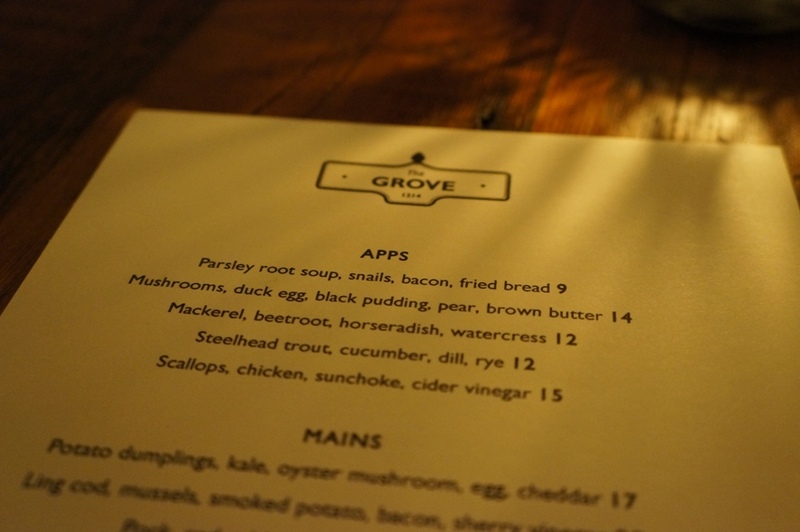 Named the best new restaurant of 2012 by Macleans Magazine, I was eager to try the Grove’s British cuisine. This British gastropub is brought to you by Chef Ben Heaton who previously worked at One and Colborne Lane. 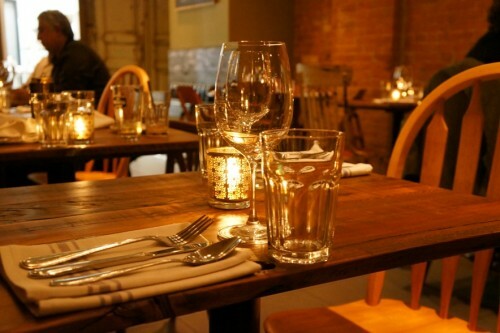 The restaurant is located on Dundas West between Ossington and Dovercourt. We had a 7 o’clock reservation on a Friday evening and by 7:30 the restaurant was packed. 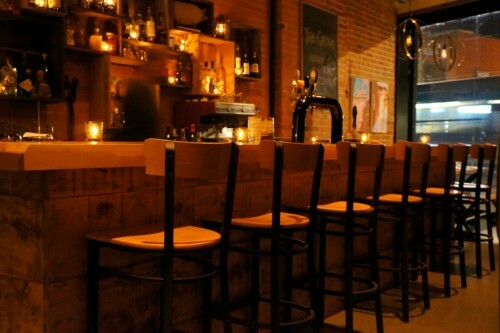 While the space was a little narrow, it had a nice cozy feel to it with the exposed brick walls and candlelit tables. Unfortunately after receiving a warm welcome after being seated, it took a long time for someone to come by to take our order. Don’t expect a quick meal here – we didn’t leave until around 9. 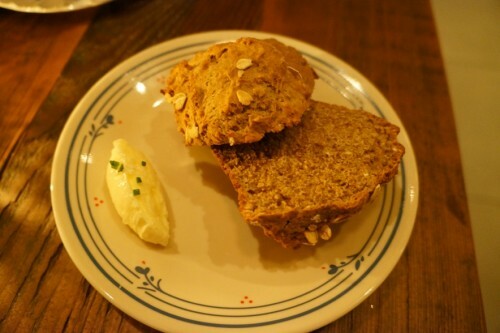 Shortly after ordering, our server brought over some complimentary Housemade Soda Bread – with whipped butter. They reminded me of a dense muffin. I enjoyed the crisp topping and those of you who are muffin-top fans will feel likewise. The bread tasted great with the whipped butter and was a great way to start the meal. 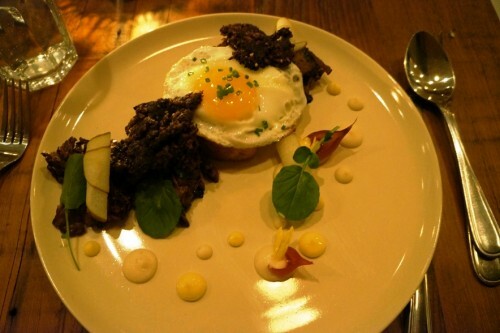 For my starter, I went with the Mushrooms, Duck Egg, Black Pudding, Pear & Brown Butter ($14). Given its description on the menu, I didn’t have a clue what to expect. 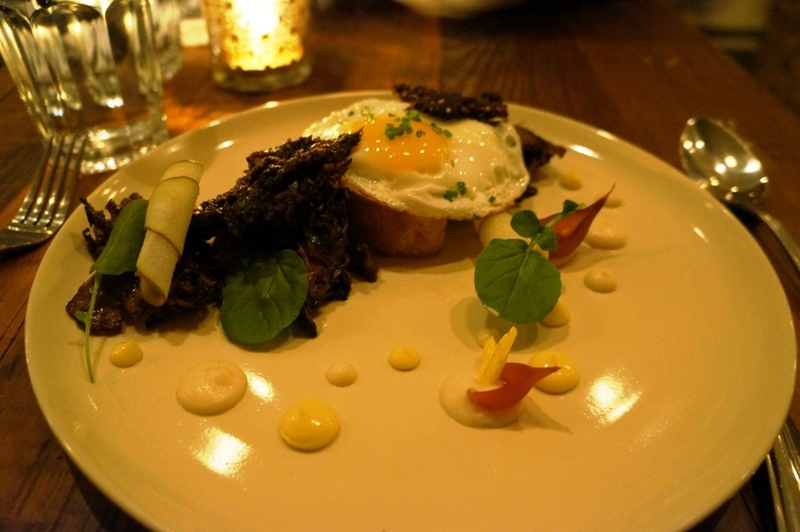 It turned out to be a duck egg sitting atop a thick slice of sourdough bread and surrounded by sautéed hen of the woods mushrooms and black pudding. 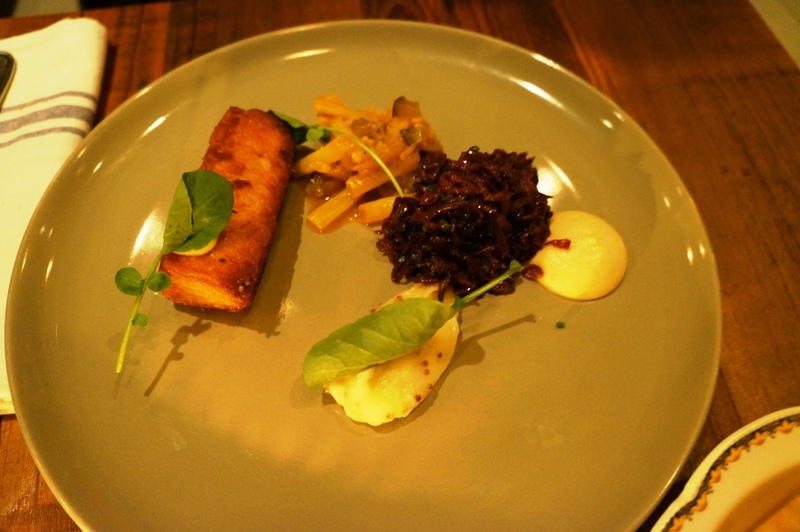 The dish consisted of many different components which I really enjoyed. 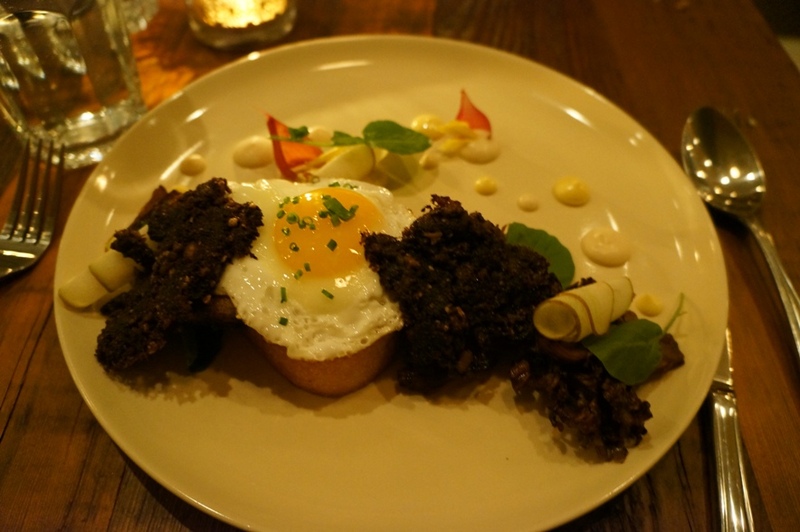 I just love the texture and earthiness of hen of the woods mushrooms which paired perfectly with the crumbly black pudding. A great appetizer! The second starter we ordered was the Parsley Root Soup – with snails, bacon and fried bread ($9). 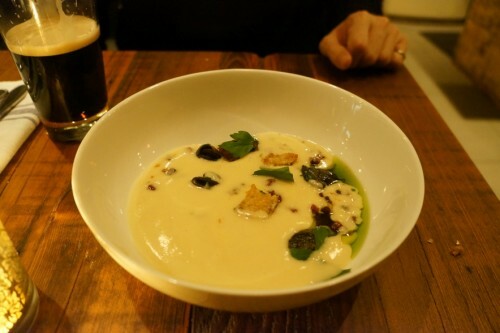 I’ve heard a lot of great things about this soup and I can understand why. The soup was poured into our bowl at the table and I was really impressed that the soup was a pure veggie puree without the addition of any cream. The soup had a sweet flavour with a little salitness from the bacon and a nice bit of crunch from the delectable pieces of fried bread. 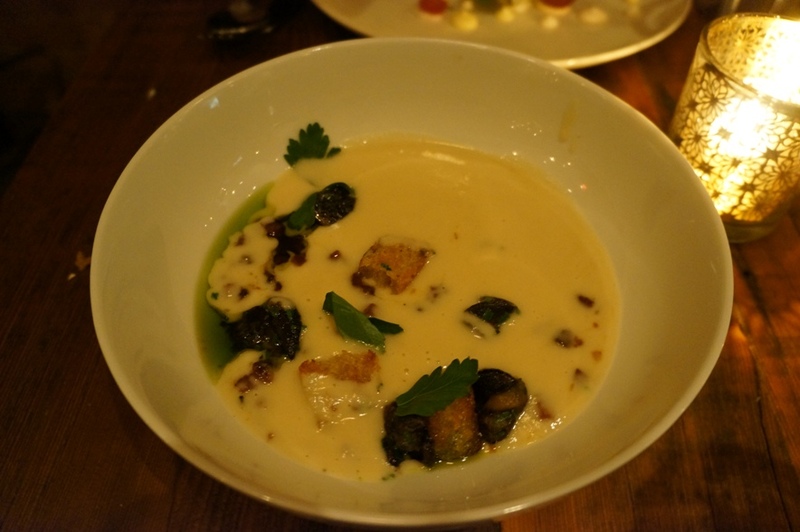 With the addition of the plump pieces of snails, the bowl of soup was absolute perfection. If you’re coming to the Grove, don’t miss out on this! 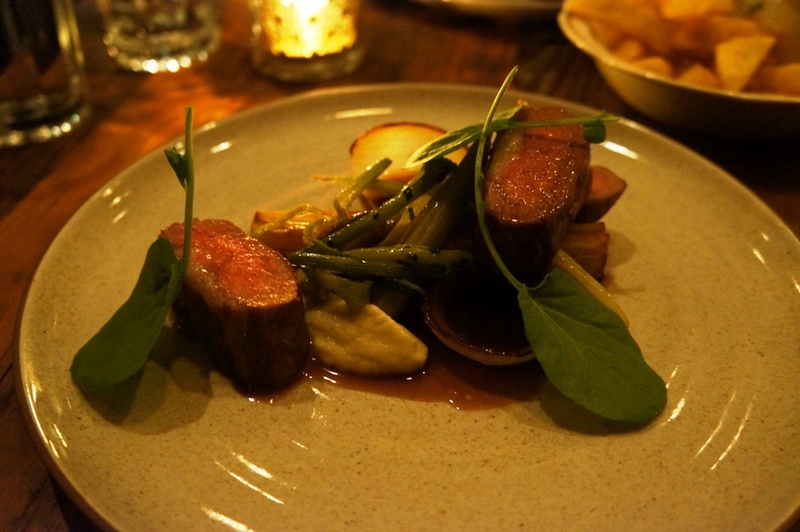 For my main, I went with the Lamb – with fennel, onion and Cumberland sauce ($24). I realized they didn’t ask me how I wanted my meat cooked and thankfully it came out a nice medium rare. 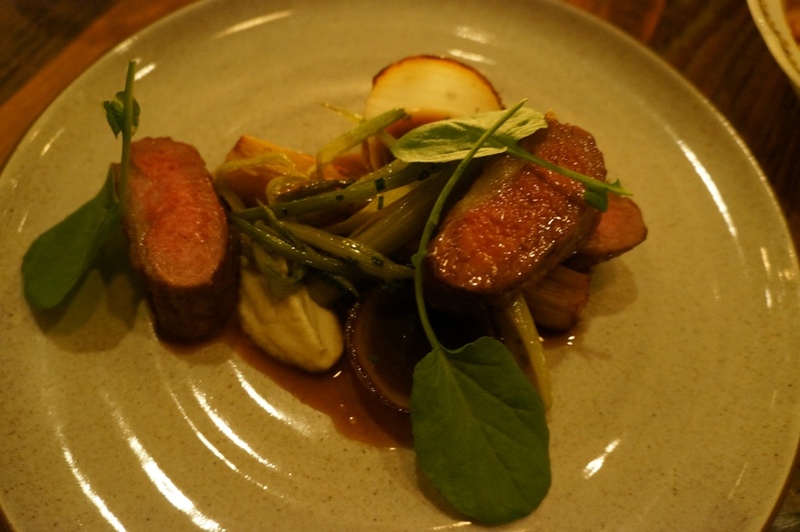 The three pieces of lamb came with a little dollop of pureed fennel, a thin slice of potato cake and a little bit of greens. It was a pretty good dish overall… unfortunately it came out a little cold. The sauce wasn’t warm at all – perhaps it had been sitting around for a while. Mike went with the Pork – with red cabbage, apple and mustard ($20). The menu didn’t indicate what cut of pork it’d be and we were happy to see that it was pork belly. I wasn’t a huge fan of its preparation – it seemed to have been fried which dried it out. Not the fatty or juicy pork belly that I prefer. While it was a touch dry, the side of red cabbage certainly helped. Mike enjoyed the dish a lot more than I did. Oh, and similar to my lamb dish, this pork dish was also on the lukewarm side. 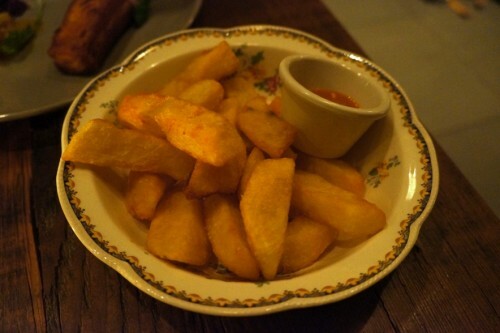 The entrees came with a complimentary side of Chips – with housemade curry ketchup, which was a nice surprise. I don’t normally like my fries thickly cut like this but they were done incredibly well. Perfectly crisp and very well seasoned. Unfortunately we didn’t have any room for dessert but the Spiced Chocolate Profiteroles were a perfect little bite that came with the bill. 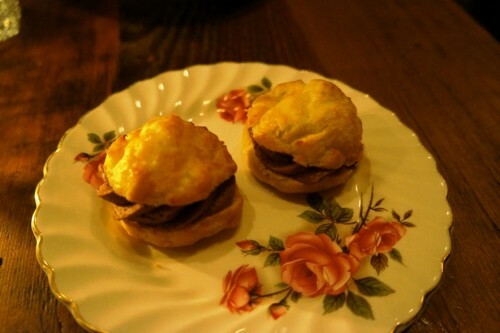 These little treats are always a nice touch at the end of a meal when you only want a little taste of something sweet. So, did I enjoy my meal at the Grove? Yes. But best new restaurant in Canada? Maybe not. I just went to The Grove and LOVED that soup! 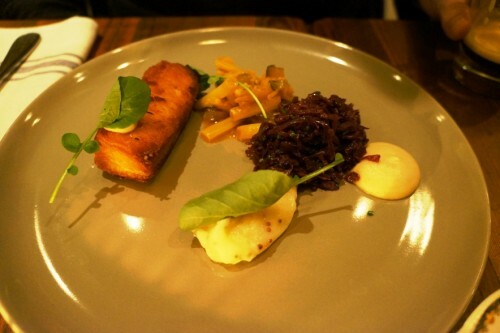 I had the ling cod and it was fantastic….came with smoked potatoes and kale. Also shared the lamb and agree, it was good but not amazing. Beautiful plates! I’d go back for a second helping of that amazing soup!